The second element highlighted by our Element of the Month program is OXYGEN. By this point the students understand the Element of the Month program and have prepared a poster. A full class period is devoted to the discussion of oxygen and the accompanying demonstrations. Students will usually immediately respond correctly that oxygen is found in the atmosphere. When prodded “Where else?” they will answer that it occurs in water. Further “What else?” prodding usually leads to looks of puzzlement. They are likely to be unaware that most of the planet’s oxygen is to be found chemically combined in the rocks in the earth’s crust. Clearly oxygen is essential for life! Further, it should be noted that combustion in its many forms powers human society, and that oxygen can be considered a global energy currency. One can derive energy from combustion reactions anywhere on the planet. However, oxygen is also one of the highest production volume commodity chemicals. It is used in the manufacture of steel (to remove sulfur, carbon, and phosphorus impurities that make iron brittle), paper, chemicals, rocket propellants, and in hospitals. Students will know that oxygen is a colorless, odorless gas (figure 1). We ask the class if these properties can be used to identify oxygen. Often there will be agreement until we ask what other colorless, odorless, tasteless gases there might be. Very quickly the students will realize that carbon monoxide is colorless, odorless and tasteless. Since we don’t have a membrane separation plant at hand, how might we prepare oxygen in the high school laboratory? Writing the reactions on the board, we note that there are several possible ways, and each method involves decomposing certain oxygen - containing compounds (see figure 2). For example, there is the thermal decomposition of red mercuric oxide that led Joseph Priestley to discover oxygen in 1774, the thermal decomposition of potassium chlorate (which is generally regarded as too dangerous to practice these days), the electrolysis of water (too slow), and the decomposition of hydrogen peroxide. We note, however, that the decomposition of sodium chlorate is used in the oxygen generators in commercial aircraft. Video 1: Electrolysis of a (neutral) sodium sulfate solution (accessed March 2019, subscription required). Derived from Jerrold J Jacobsen and John W. Moore. Chemistry Comes Alive! Vol. 1: Abstract of Special Issue 18, a CD ROM. Journal of Chemical Education 1997 74 (5), p 607-608. DOI: 10.1021/ed074p607. At this point, if an electrolysis apparatus is available, the electrolysis of water may be started and permitted to continue through the remainder of the period (video 1 and 2). Video 2: Electrolysis of a neutral solution animation (accessed March 2019, subscription required). Derived from Jerrold J Jacobsen and John W. Moore. Chemistry Comes Alive! Vol. 1: Abstract of Special Issue 18, a CD ROM. Journal of Chemical Education 1997 74 (5), p 607-608. DOI: 10.1021/ed074p607. We note that the classic test for oxygen is the so-called glowing splint test, in which a wooden splint such as a coffee stirrer is ignited, blown out, and the glowing ember is placed into the oxygen gas that we just prepared (see figure 3).3 The ember bursts into flame. We ask the class what would happen with nitrogen or helium? Next we ask the class why this may not be a great test for a sample of an unknown gas. What would happen if we tried this test with propane or hydrogen? Next we generate additional portions of oxygen and demonstrate that oxygen violently accelerates the combustion of a piece of charcoal4 and of iron in the form of steel wool.5 A video showing the combustion of steel wool may be found in Tom Kuntzleman's ChemEd X blog post, Put a Spark in Your Stoichiometry Lesson. These two demonstrations are naturally invariably well received by the class and are repeated with the room darkened. With the room still darkened, the combustion of a match box striker strip (which contains red phosphorus) is then shown, which burns with a brilliant light.4 We put the lights on and show the class a "No Smoking" sign and ask why one might see signs like these in areas where oxygen is in use. Using a rolled up piece of tissue paper as a surrogate for a cigarette, we repeat the glowing splint test. 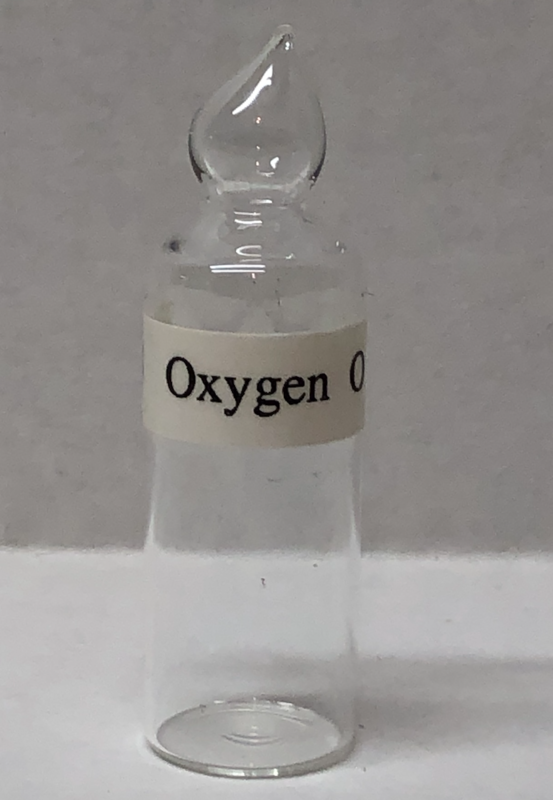 If time permits, we ask the class if they can name another form of oxygen, and solicit the allotrope ozone as the answer. We explain to the class what allotropes are and note that other elements such as phosphorus and carbon also form allotropes. We ask how ozone is formed, and students will usually correctly answer that it is formed from diatomic oxygen in the presence of high energy UV light or electrical energy, such as lightning. 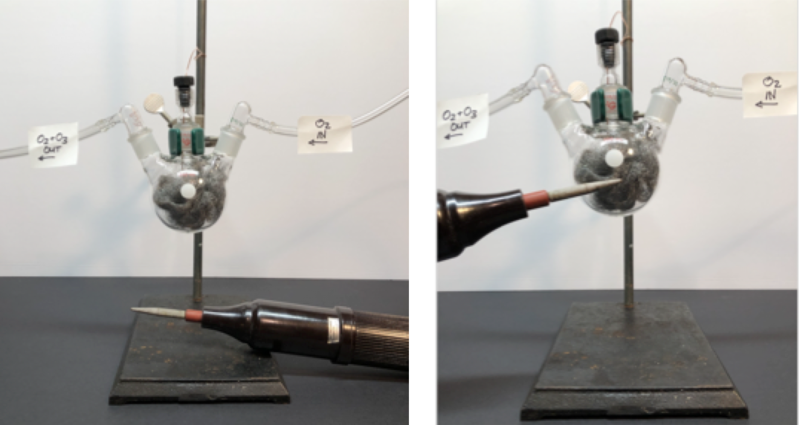 We prepare ozone using a high voltage discharge and show that it is more reactive than diatomic oxygen by passing the ozonized oxygen through a flask of potassium iodide solution (see figure 4).7 No formation of iodine is observed until the high voltage discharge is turned on. A brief discussion of the properties of liquid air and the concentration of oxygen from liquid air may be found in Tom Kuntzleman's ChemEd X blog post, Collection of and Experiments with Liquid Air. See also Abstract 2-9 in Alyea, Hubert N. Tested Demonstrations in Chemistry, 6th ed. ; Journal of Chemical Education: Easton, PA: 1965; pp 9. Oxygen may also be generated from hydrogen peroxide and laundry bleach according to the following equation: NaOCl (aq) + H2O2 (aq)  O2 (g) + H2O (l) + NaCl (aq) An excess of hydrogen peroxide is used to ensure complete reaction of the sodium hypochlorite. A ratio of 2 teaspoons (10 mL) of laundry bleach and 3 teaspoons (15 mL) of 3% hydrogen peroxide for each 4 ounces (about 120 mL) of volume in the test bottle works well, generating enough oxygen to displace the air from the bottle without adding too much liquid to the bottle. The bleach must be added in small portions (1 to 2 teaspoons or 5 to 10 mL) at a time, to control the bubbling that occurs. See Wright, S. W. J. Chem. Educ. 2003, 80 (10), 1160A-B. See Conant, James Bryant; Black, Newton Henry New Practical Chemistry; Macmillan: New York, 1940; pp. 23. See Conant, James Bryant; Black, Newton Henry New Practical Chemistry; Macmillan: New York, 1940; pp. 34. Summerlin, Lee R.; Borgford, Christie L.; Ealy, Julie B. Chemical Demonstrations: A Sourcebook for Teachers Volume 2, 2nd ed. ; American Chemical Society: Washington, DC, 1988; pp 43. Ransford, J. E., J. Chem. Educ., 1951, 28 (9), 477. See also Abstract 2-33s in Alyea, Hubert N. Tested Demonstrations in Chemistry, 6th ed. ; Journal of Chemical Education: Easton, PA: 1965; pp 58.